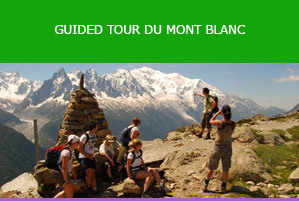 The Tour du Mont Blanc is justifiably one of World’s most famous hiking trails. Popular with people from all over the world, notably Europe, USA, Canada and Australasia. Hiking through the Alpine landscapes with spectacular mountain views. Hotels and other accommodation are generally very good for a point to point trek. The TMB can be busy – particularly in August when it is almost impossible to get a room unless you booked months in advance. June, July and September are a bit quieter, but the increasing popularity of the trip means that booking well in advance is important if you are limited to certain holiday time. Whether you are hiking the TMB solo or in group, you will have a fabulous Alpine experience. The landscapes, snowy mountains, the towns such as Chamonix and Courmayeur, the hotels, food and wine all make up the complete experience . You will pass through France, Italy and Switzeraland while hiking and meet people from all walks of life from all over the world. Training for the tour is very important, particularly if you are not in shape or are new to hiking. Even if you are an experienced trekker, you still need to prepare yourself for the journey. 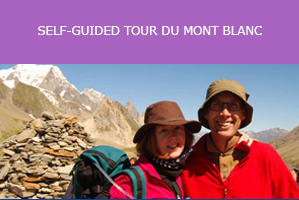 The daily walks on the Tour du Mont Blanc are between 6 and 8 hours, and staying outdoors for up to 10 hours. Best to pack for all weathers and have some spares too. So long as your luggage is transferred from hotel to hotel you can take as much as you like. If you are back-packing or camping, it will be a different story. You can find info on fitness and a list of equipment here.